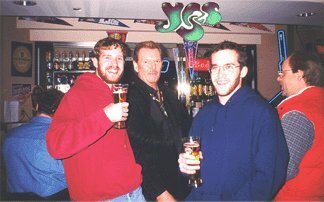 I've been to a lot of Yes concerts over the years but this one will always hold a special place in my heart. It so happened my ex-wife and I were staying at the hotel where they were playing and we had checked in and got on the elevator to go to our room and lo and behold! Chris Squire got on the elevator with us! We just greeted him, no histrionics or anything that would embarrass him or us. I never really realized how big he is. That same night was the concert and even though it was a small venue with a small crowd, Yes played as if they were playing a 100,000 seat arena. 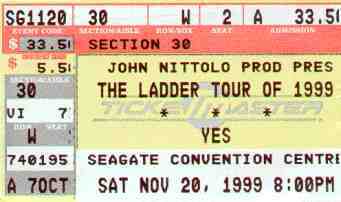 The music was fantastic and the cuts from the Ladder were tremendous. I can't praise their virtuoso playing enough. They were just plain fantastic. 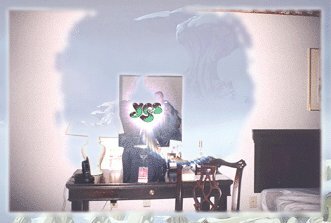 I had not seen Yes in 15 years, since the 90125 tour. 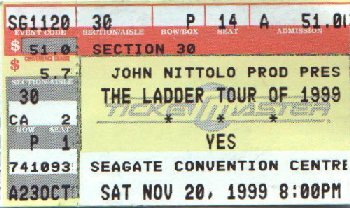 I still followed them, somewhat distantly, through the 90's, but, thanks to these tour pages and purchasing "The Ladder" - my first Yes CD since Union - my interest in them returned, and I found myself at the Toledo concert with my wife. I was prepared for maybe a mediocre performance, since I am older now, more critical, also a musician, but I was surprised - from the first song YIND, Yes did a great show! Full of energy and professionalism. My wife, long-time Yes head, also was amazed. Steve Howe was especially magnificent. Jon stopped "Homeworld" shortly into it (Says Jon " . . for the first time ever . .") when Steve Howe had guitar problems, no sound. So after brief, minor and amusing confusion/Steve guitar change, Jon tells Billy to start over at the first verse. Which they do, and proceed to play it great. So . . . if they have pre-recorded stuff going on (which they certainly must, cleverly, seemlessly interwoven into the performance - e.g., the harp in Awaken is pretty obviously not live, as Jon "plays" his "prop") how did they do this? Seeing Jon Anderson up there for the first time in years, I got a strange insight. His graceful, songbird demeanor, the movement of his hands and arms, that voice, the lyrics - especially reaching way back to "Time and a Word", made me see him as a representative of the best aspects of the `60's love generation, persisting through to the current day. Everything about him and his song ideas seems to say love and innocence incarnate. He is still reaching out with his message to the small crowds currently open to listening to this. I realized, no one else plays music anything like this anymore. Still exuding youthfulness, he may one day be the last hippie standing. Hey Yes fans......for those who haven't seen the show yet, u are in for one great professional performance. The songs off of the Ladder sounded fantastic. It was the most enthusiasm of new YES material by the audience that i have seen in years. Of course, Homeworld stood out. One interesting bit of news.....As the group began playing the first verse of Homeworld, Steve began motioning to the stage crew that he was having technical problems. 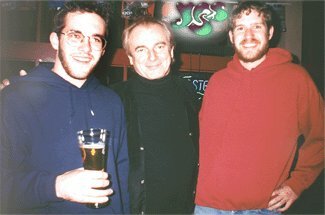 Jon noticed this and calmly directed each member to stop playing (never saw this in seeing YES for 25 years). He looked at the audience, smiled, shook his head and apologized for the tech problem. He even began to chat direct with the audience for a minute to act as "filler" as Steve got a replacement guitar. When the replacement was hooked in, they started playing Homeworld from the very beginning again. And did they play it. "Awaken" stole the show....powerful, magical and right in tune. Igor's keys are turned way up (as compared to the OYE tour). Obviously, he is much more confident and knows the material. When the show ended, the group were all hugging, smiling and giving hand slaps.....they knew their performance was memorable....I left feeling very fortunate to be part of this show and will be in Cincinnati tomorrow eve (11/21) to see them again. I can't wait. Someone at the show in Toledo said the Taft (Cincy) Theatre is sold out......Lets rock, boys.....and NEVER retire; we all admire your professionalism that is totally lacking with most of the groups of today. Still a bit fatigued from Friday's Royal Oak misadventures, we headed back up the same highway to Toledo. No, rain, no construction delays and all in all a nice ride. The Seagate Center could not have been more of a polar opposite to the previous venue...all portable bleachers and chairs set up in an empty (seemingly brand new) airplane-hanger styled room. Everything was more than cool until we found our seats, which were apparently numbered differently in 3d reality than they were in the "dream" reality of Tixblaster.com. We were as far on stage right as possible and right in front of the PA. Since my beautiful and zany wife thought it would be a good idea to bring Eli, our 2 year old (who has been a serious Yes fan at least since his embryonic phase), I knew we had to move. After expressing my despair to the box office folks (for about a half hour) their kindly rep "Dave" agreed to move us...to three new seats in the front row, five feet in front of Steve! When the band hit the stage, Jon looked down, saw Eli (stylishly decked in his new gun-range headset), and mouthed "Awesome!". Anyway, another great show with the same setlist. I can't comment on the sound 'cause I was hearing the band's monitors and Steve's amps more than the PA. There was a classic Yesshows' moment when Steve couldn't get his Telecaster to work just as he was about to kick into Homeworld. He looked helplessly at Jon, who stopped the song saying "we can't do it without Steve". They hooked him up with the blue Steinberger and Billy started it again at the beginning of the first verse. The whole front row deal was a bit intense for Eli, who had to go walk around for a while. When they came back for the encores Billy and Chris came over and jammed for him... which he thought was so cool that it used up the last of his energy and he fell asleep for Roundabout and the ride home. All in all, a night full of pleasant surprises, the final one being when I looked up as the band was leaving the stage, to see my wife holding Eli and shaking hands with Jon...(and Barry, there will be no public commentary on "skin texture" *or* the multi-dimensional currents that were exchanged).